Has your current furnace reached the end of the line? At Central Carolina Air Conditioning, Plumbing and Electrical, we understand that selecting a new heating system is a big commitment. Allow us to handle your heat installation with the most reliable, energy efficient heating system priced within your budget that will give you years of quality service. Central Carolina Air Conditioning will help you choose the right furnace for your home by providing you with all the necessary information to make an informed, cost-efficient decision. When you're ready, we'll install your new furnace and get it running ASAP. Since the professionals at Central Carolina Air have been in the HVAC business for more than 50 years serving Greensboro and the Triad, we've seen it all and can answer any of your questions before, during, or after the installation process. How can you know you can place your trust in Central Carolina Air Conditioning? Because we do business where you live, among your friends, neighbors, and co-workers. Plus, as a Central Carolina Air Conditioning customer, you will always have the advantage of our 24/7 emergency services. So if something does go wrong, even during the night or over a weekend, you have our guarantee that we'll be there to quickly repair it. 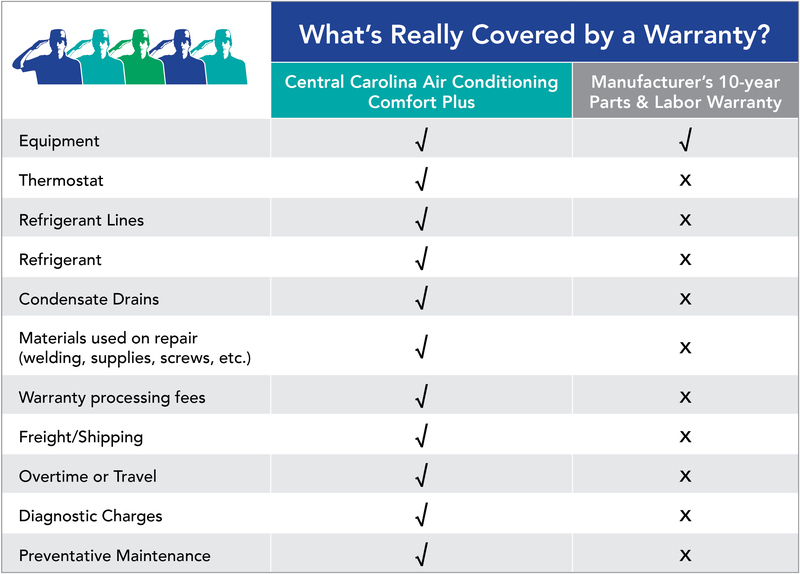 Also as a Central Carolina Air Conditioning customer, you have the assurance that you've got professional service technicians and quality products on your side, providing you and your family with trusted, reliable, and affordable comfort year round. Many duct systems currently in place are improperly sized, have leaks, or were poorly designed to save money when the home was built. A duct system with any or all of these problems will increase your costs and decrease your comfort regardless of the age or efficiency of your heating and cooling system. Our Air Flow specialist can determine if the system is properly sized for the heating and cooling requirements of your home. They can determine if the duct system is adequate to meet those needs and give you a solution that will lower your costs and increase your comfort. Central Carolina Air Conditioning & Heating Installation in Greensboro has long believed that a properly installed, well maintained system will provide many more years of operation and comfort than one that is not. Our exclusive Comfort Plus and Comfort Plus Extension plan were developed to provide the customer with the best coverage in the industry. When you purchase a Comfort Plus System from Central Carolina Air Conditioning, Plumbing & Electric you not only get the highest level of quality on your installation, you get five years of coverage on all parts, labor, and preventive maintenance. We also commit to an annual price, beginning at year six, to extend this coverage for five years with our Comfort Plus Extension. During this time you will not pay for any parts, labor, refrigerant, diagnostic charges, or trip charges. In addition, you will get seasonal preventive maintenance every year. In simple terms, you will know the complete cost of your system installed by Central Carolina Air Conditioning (except your energy cost) on the day you buy your Comfort Plus system from us. What if your heating and air conditioning system could choose the utility where you get the best rate? With our exclusive Two Smart system you can. What does Two Smart mean? Two Smart system from Central Carolina Air Conditioning It’s Environmentally Friendly – Two Smart protects the environment by consuming less primary energy than conventional heating systems, thereby reducing gas emissions, such as carbon Dioxide (CO2), Sulphur Dioxide (SO2), and nitrogen oxides (NOx) that can harm the environment.